This 8,000 square foot house is located in an exclusive development built around a world class golf course. The house is sited to take advantage of views to a nearby fairway and tee area. A two story gallery space starts at the front entry and leads into the living room with its raised uplit ceiling. 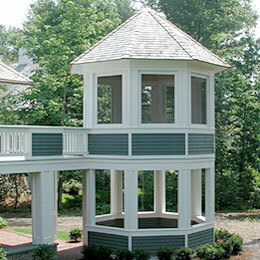 A transitional area between the inside and outside is created by an attached deck and a screened gazebo. 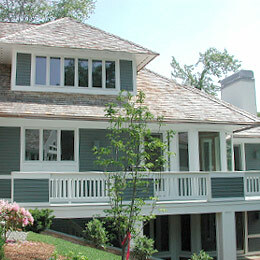 The clients desired a house that would be large enough to entertain and accommodate their many guests. The house has a private guest suite and two other guest bedrooms in addition to an expansive master bedroom suite. The lower level entertainment center includes a custom designed bar and also audio-video cabinetry.